Home Routes / Chemin Chez Nous is a national non-profit arts organization incorporated as Home Routes Inc. in Manitoba in February 2007 to create new performance opportunities for French and English speaking musicians and audiences in urban, rural and remote communities across Canada, hosted by volunteers in their homes and other community venues. Home Routes Inc. is governed by a national Board of Directors and operated by a small professional staff and a national network of volunteer house concert hosts organized in regional touring circuits throughout rural, remote and urban communities across Canada. Home Routes Inc. engages Artistic Directors who curate, plan and execute a series of professional artistic concerts/programs each season for each circuit, to benefit Canadian audiences and artists. To create a dynamic social and organizational performance infrastructure that serves and presents professional performers and creators of original music, including emerging and established artists representing the cultural diversity of Canada. To ensure access to live concerts of excellence by audiences in rural and remote communities throughout Canada. To support career advancement for participating musicians by contributing to audience and market development opportunities. To create, train and assist a self-renewing national network of volunteers in the art of hosting live performances. Operate with volunteer house concert hosts so that all revenue from concert admissions, product sales, school/community workshop fees and performance royalties are paid directly to artists. Manage performance royalty requirements for musicians at no charge so that composers receive royalties for every applicable concert. Contribute to career advancement, audience and market development for participating musicians. Create and coordinate tours of sequential house concerts arranged in circuits of 12-13 easily accessible communities over 14 days. Minimize touring artists’ expenses. 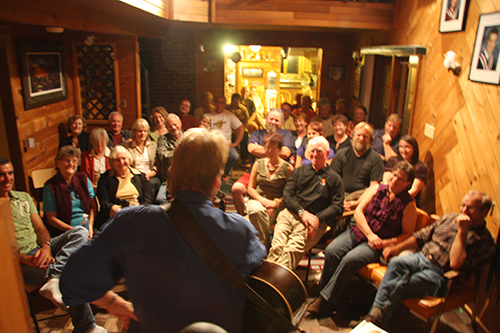 House concert presenters provide accommodation and meals. Professional artistic direction to benefit audiences with performances of the highest quality. Professional programming that resonates with Francophone and Anglophone audiences. Diverse, balanced and entertaining concert series for every circuit, creating loyal audiences for the hosts and new fans for the performers.